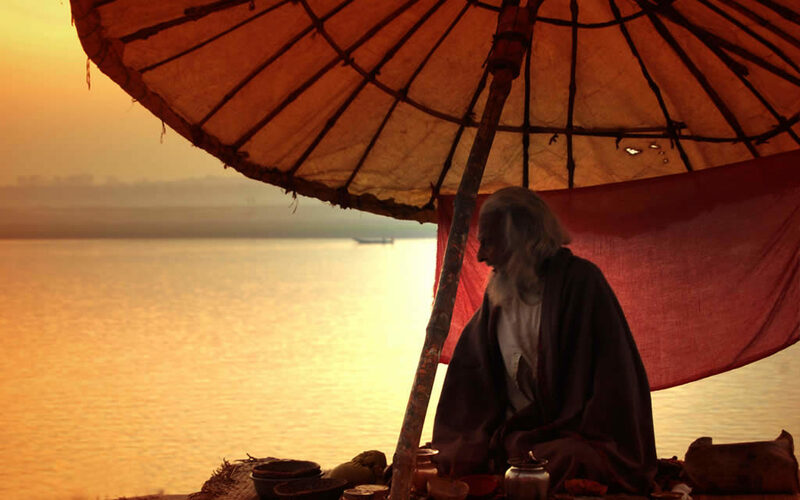 In Varanasi they love the river as a mother and a source of sustenance. They garland her with flowers and every evening a row of priests stand at its edge at Dasaswamedha Ghat holding giant aarti lamps flaring with fire and sway and dance to the beat of booming drums and the rising chant of mantras. 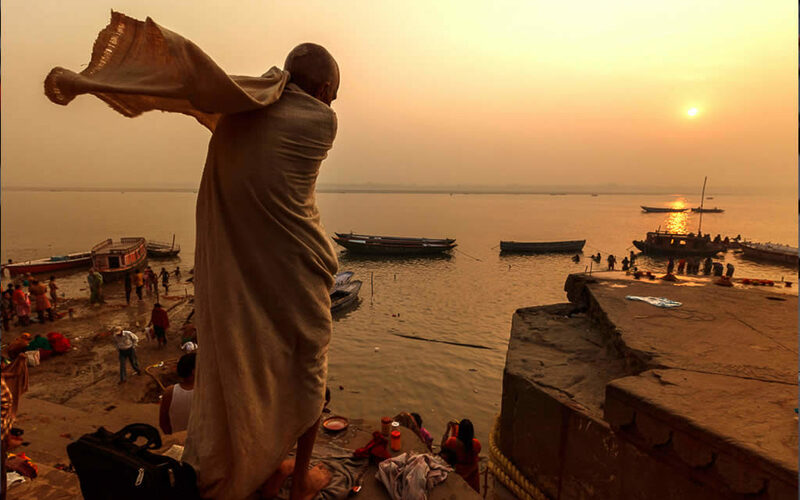 But being Varanasi, ancient and cynical, they also take the river for granted. They burn the dead by her banks and her water is cloudy with the flowing effluents from the city. The Ganga is the premier among the river goddesses like Yamuna, Saraswati and Kaveri. She is depicted as a beautiful woman holding a pot of water and a lotus flower, sitting on a lotus and riding on the back of a crocodile called makara. In some myths she is also called one of the consorts of Shiva because her descent from heaven is connected closely to the presence of this god. At Varanasi the river that is flowing relentlessly eastward towards the Bay of Bengal makes a sudden loop northwards creating the crescent shaped banks along which the ghats have been built. They say the river fell in love with Kashi and nearly changed her mind and turned back here. The myths say that at one time Ganga was a celestial river flowing in heaven. On earth a king named Sagar who was an ancestor of Lord Ram, performed an ashwamedha yagya where a horse is let loose to wander. When Sagar’s sons could not find the horse they accused a sage named Kapil Muni of stealing it and the enraged sage opened his eyes and burnt them to ashes. Their ashes lay by the ocean at Gangasagar in Bengal. Sagar was told that the only way to save the souls of his sons was if Ganga agreed to come down to earth and washed away their ashes. However all his prayers were in vain and the river goddess was not interested in leaving heaven. Then Sagar’s grandson Bhagirath performed such severe prayers and penances in the Himalayas that the goddess was forced to agree. Ganga turned towards the earth but she was angry and she came down in such a mighty torrent that Brahma feared that she would wash away all his creation and destroy the earth. Brahma begged for Shiva’s help and the generous god put is matted head in the path of the river. Ganga got lost in the coils of his hair and as her anger abated she flowed down slowly to earth. So in the Himalayas where she appears first the river is tumultuous and angry but by the time she has entered the plains she is serene and generous. The Ganga appears as the river called Bhagirathi at a Himalayan cave called Gaumukh above Gangotri in Uttarakhand. Then all along her journey she is joined by other rivers like the Alakananda, Mandakini and Yamuna until she reaches Gangasagar by the Bay of Bengal where the ashes of Sagar’s sons lay and they are finally swept away to sea and liberated. Among all the pilgrimages along Ganga’s journey from Kedarnath to Rishikesh, Haridwar and Gangasagar, Varanasi is the most venerable and the most sacred. It is a magical cityscape that has dazzled visitors for centuries. For a stretch of about five kilometres an endless spread of stone steps flow down to the river and these are called ghats. Above the ghats are temples, mansions and palaces often built in red sand stone. From dawn the ghats are busy with people bathing, praying, washing clothes, sadhus meditating before burning fires, while vendors sit with mounds of flowers and empty bottles for pilgrims to collect gangajal. The priests called ghatias sit under their round reed umbrellas and offer to perform all the religious rituals of a good Hindu life, from the namkaran (naming ceremony) and mundane (first haircut) to the funeral rites of shraddha and pindadaan. The best way to see the ghats is by boat. If one takes a boat and floats past these endless stretches of stone steps one gets an unforgettable panorama of a vibrantly colourful world teeming with life. One can see people from all across India, Tamilians in silk saris, Bengalis in dhotis and Rajasthanis in dusty turbans, all bathing, praying and performing puja. All gathered here with their deep faith in the forgiving and purifying power of a river, creating a wonderful portrait of our country. There are eighty ghats and the first and southern most, Assi stands at the confluence of the Ganga and Assi rivers. Next to it is Tulsi ghat where the steps lead to the house where Tulsidas lived while composing the Ramcharit manas. The most famous and one that is always crowded is the Dasaswamedha ghat that leads to the Kashi Vishwanath temple. Manikarnika and Harishchandra are cremation ghats and are always wreathed in smoke from the burning pyres. At night the fires can be seen down the river and it is said they have not died down in centuries. Many of these ghats have been built by kings and queens, nobility and saints. Among them are Queen Ahilya Bai Holkar of Indore, Raja Man Singh of Amber, the religious teacher Anandmayee Ma, sects of Sadhus like the Mahanirvani akhara and Mir Ali a Muslim governor of the city. Also a ghat built by boatman and one named after Dr. Rajendra Prasad, India’s first president. The five ghats that are believed to be the most sacred are Dasaswamedha, Assi, Adi Keshava, Panchganga and Manikarnika and these are visited by pilgrims in a religious yatra called Panchtirthi. The best time to sit at these ghats is at dawn or at sunset watching the slow movement of the waters as a boat with giant sails floats past. Pick a quiet stretch of steps may be at Kedar or Manmandir Ghat as the sun rises over the river touching the ripples with shades of copper and silver and the sky deepens from grey to blue. Or at sunset watch the river reflect the orange rays of Surya and then as the sun dips past the horizon, as if at the turning of a switch, the waters will suddenly turn dark. All the important festivals that are celebrated in Varanasi like Makar Sankranti, Shivaratri or Dussehra include a ritual bath in the river. Then there are two festivals unique to the city and its mother river – Ganga Saptami and Ganga Dussehra. Both of them are celebrated in the summer months of May and June. People believe that the Ganga began her descend to earth on Ganga Saptami and entered the plains of north India at Haridwar on Ganga Dussehra. On these days people perform special prayers and they string huge lengths of marigold garlands, then go out in boats and trail them across the water as if decorating the river. Every evening at dusk Dasaswamedha Ghat presents a dazzling ritual aarti of the river. The best way to see it is by sitting in a boat parked across the ghat. As the drums begin to play, a row of priests clad in sparkling white dhotis worship the river with flowers and incense. They float garlands into the water to form exquisite patterns and then they pick up giant arti lamps aflame with lights and bend and bow, sway and turn in synchronised movement to worship the river. Slowly dusk falls and the sky darkens, after a while, all you can see are the flaring lamps rising and falling to the beat of the drums. Then earthen lamps are lit on the steps of the ghat and turn them into a stairway to heaven. The air is fragrant with incense smoke and echoing to the booming of the drums and the river is a dark splashing presence around your boat. Then people start floating small leaf cups in the water with a tiny earthen lamp in them and soon the river turns into a sparkling wonderland of golden lights floating away. 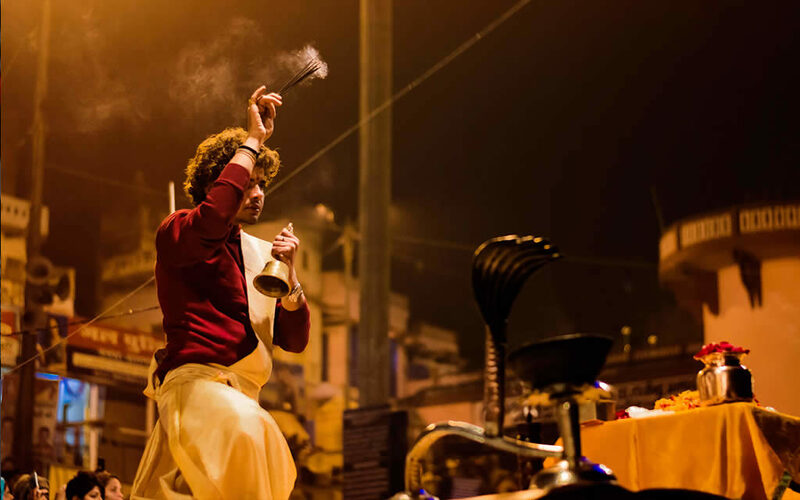 The Ganga aarti is the theatre of faith at its most dramatic and memorable and you never forget the experience.